AUSTIN — A Big 12 loss at home against Kansas would not have been the résumé-tanker the loss at Georgia was, but it would have been another tally in the loss column for a team that for multiple reasons, needed the win. The win provided a résumé-booster instead, as the Longhorns defeated the No. 11 Jayhawks 73-63 behind a 16-point performance from Dylan Osetkowski. Texas trailed Kansas for nine seconds the entire game, but let’s look at all 20 minutes. 20:00-14:24 – Bad transition defense gave the Jayhawks their only lead of the game, lasting less than 10 seconds until Jaxson Hayes flushed a dunk at the opposite end to tie it. The game would remain tied until the 17:42 point when Dylan Osetkowski set the tone with his first of back-to-back points in the paint against a smaller Jayhawk lineup. Both teams kept the starting five on the floor until the media timeout, a lengthy stretch of basketball for anyone, but Texas’ energy and dedication to its best offensive principles resulted in an early lead for the Horns, 6-5. 14:24-11:42 – Texas shut out the Jayhawks in this portion, including a sequence where Kerwin Roach made one of his handful of three-pointers over the 2-3 defense of Kansas. That quickly led Self to switch back to man and allowed for Texas to run its regular offense instead of struggling to force the ball into the post against zone. Snoop’s back-to-back threes were followed by one of three shot clock violations on the evening by KU. Holding KU scoreless over this portion of the game was part of the strong defensive tone Texas needed to set against a team that has struggled to break 60 during the conference season. 12-5 Texas, 6-0 Texas in the segment. 11:42-7:48 – Kansas responded to Texas’ defensive stretch with seven points over almost four minutes, most of them assisted by Texas mistakes. Several players missed shots from inside and out, but continued to play tough defense. Texas maintaining and building a lead over this portion of the game despite its sloppy play boded well for Shaka Smart’s team, and started building more and momentum and belief for those in burnt orange in the Erwin Center. 20-12 Texas, 8-7 Texas in the segment. 7:48-3:50 – Texas went on one of its typical end-of-half dry spells, scoring four points over the short portion. However, the defense held its end of the bargain once again, limiting Kansas to four points. Another shot clock violation forced by Texas told the tale of the tenacious defense played against a team it had a size advantage against. 24-16 Texas, 4-4 in the segment. 3:50-0:00 – However bad the previous spell was, this one was much worse and forced Smart to take a timeout with 1:41 left in the half. After the timeout, the offense wasn’t much better. It was embodied by volatile end-of-half offense from younger and older players alike, capped by a Roach forced three in isolation. Despite everything going about as right as things possibly could for this Texas team in this situation against Kansas, Texas entered the half leading only by three. 26-23 Texas, 7-2 Kansas in the segment. 20:00-16:23 – After forgetting what offense was at the end of the first half, Texas found it quickly in the opening portion of the second half. Courtney Ramey recovered from a play at the end of the previous 20 when he passed up an open layup to run down clock for a final possession when he hit a three pointer to get things started. Hayes followed it with a make of his own, and Texas went on to score nine over the first three-plus minutes of the half. Texas continued to do what it had done well in the first half in this early portion, and extended the slim lead it had at the half. 35-27 Texas, 9-4 in the segment. 16:23-13:48 – Poor stretch that was short. 35-30 Texas, 3-0 KU in the sequence. 13:48-7:50 – The early portion of this segment was all Texas. Osetkowski continued to utilize his size in the post against Kansas’ guard-heavy lineup, and once the Jayhawks started to bring help, he found Ramey for a three. Self’s timeout helped to right things for his team, as the visitors split the play the rest of the segment. 46-38 Texas, 11-8 in the segment. 7:50-4:35 – For the entire evening, Texas’ lead seemed to reside in the 8-10 point range. The Longhorns’ offense wasn’t terribly quick as they scored only two fast break points. 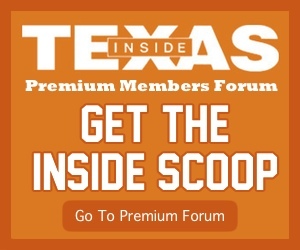 Most of the work by the Longhorns on offense came as the result of Texas’ preference to pass or drive inside before creating a two-pointer or dishing to an open perimeter shot. Texas found that here with work from Febres outside the arc twice, and several Osetkowski shots. 56-47 Texas, 10-9 Texas in the segment. 4:35-0:00 – The wildest section of the game. The score remained 56-47 when a timeout was called at the 3:38 mark. From that point, Texas scored 17 while Kansas scored 16. 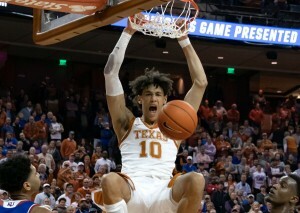 With 1:16 remaining, Hayes connected with a dunk for Texas’ only fast break points. Kansas’ scored a three pointer in response, cutting Texas’ lead to four. From there, Roach’s game became unpredictable. For better or worse, he took the game in his hands. He turned the ball over a couple times, missed a free throw late in the game, and tried to make several passes that weren’t there. He also effectively dribbled against Kansas’ late game press, hit his other free throws (along with the rest of his teammates all game), and helped Texas get to a ten-point win over the conference’s best program this century. Texas won 73-63, with the Longhorns winning the final segment 17-16. In the end, Texas won seven segments, KU won two, and one was tied.